BDtoAVCHD is software to create AVCHD discs from Blu-Ray or HD MKV files. As output we get the folder structure ready to burn to a DVD5 or DVD9. BDtoAVCHD compresses the video to achieve the desired overall size of 4.7 GB with the highest possible quality. BDtoAVCHD is created with the idea that is very simple and quick to use and obtain the best possible quality in a DVD5, so unnecessary conversions are avoided whenever possible. 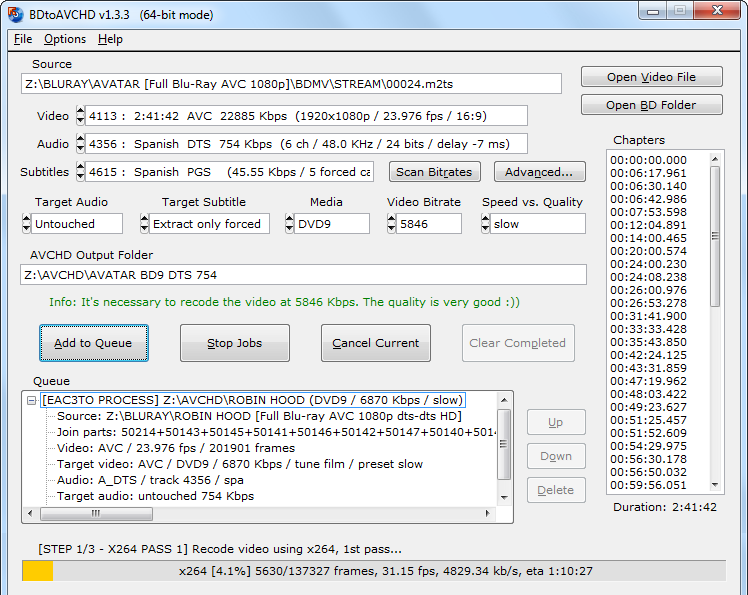 BDtoAVCHD creates an AVCHD disc (DVD5/DVD9/BD25) from a Blu-Ray or HD MKV files. ...... You do not need any codec installed as avisynth, ffdshow or Haali media splitter and records obtained are compatible with almost any Blu-Ray player or PS3. * Extract all information from the audio tracks, video and subtitles: length, language, format, etc. * Extract chapter information or allows to add it. * Select default audio track based on the most appropriate language preferences and criteria for the best quality but can also be set manually. * Calculates the video bitrate to fill the DVD5 / DVD9 (most of the times gets between 99-100% of total capacity). * Converts audio (only if necessary): PCM to AC3, DTS-HD MA to DTS Core, DTS to AC3, etc. * Detect delays in the original audio tracks and transfers them to the final work. * Re-compress the video using x264 64-bit if your computer supports. Qweas is providing links to BDtoAVCHD 1.7.8 as a courtesy, and makes no representations regarding BDtoAVCHD or any other applications or any information related thereto. Any questions, complaints or claims regarding this application BDtoAVCHD 1.7.8 must be directed to the appropriate software vendor. You may click the publisher link of BDtoAVCHD on the top of this page to get more details about the vendor.